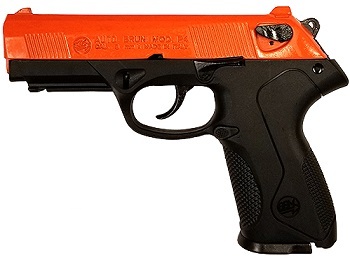 Image Below Or Add To Cart As an even safer and realistic alternative to live firearm training our PX4 with new blaze orange finish ensures your training gun will not be confused for the real thing. Many people prefer that added safety. This exclusive and high quality replica details the innovation, utility, and sleek design of the highly popular PX4 original. The PX4 is used extensively in law enforcement, Military and private instruction Firearms training. It is a semi automatic, meaning that it fires, ejects and reloads automatically each time you pull the trigger. As with all of our blank guns It comes with a removable magazine and a plastic carrying case. Features:Length: 7.5”, Weight: 2 lbs, Finish: Blaze Orange/Black, Blank Ammunition Caliber: 8mm Blanks.